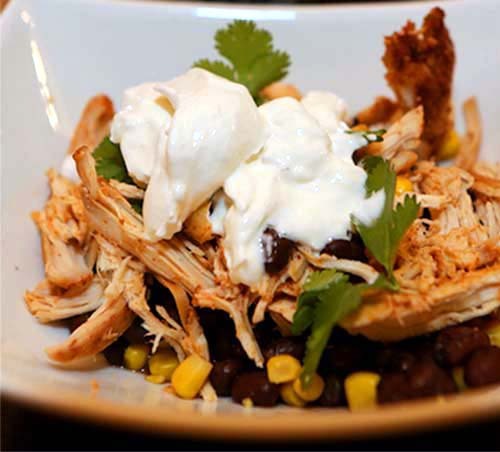 Mix the chicken, water, and taco seasoning in a slow cooker. Cook on low for 8 to 10 hours. Use higher setting for cooking in shorter duration. Serve with 3 tbsps of corn and 3 tbsps of black bean. Top with sour cream and cilantro. Hot sauce would have been nice. I just didn't have any at the time. Yum! Because of the chicken and the beans, this chicken taco salad should be very good in providing protein and lean fat. I would have loved to add chopped tomatoes for vitamin C and antioxidant, not to mention, heavenly taste. www.foodfunandhappiness.com is a participant in the Amazon Services LLC Associates Program, an affiliate advertising program designed to provide a means for sites to earn advertising fees by advertising and linking to Amazon.com, Amazonsupply.com, or Myhabit.com.